Even among the highly rated Canon L lenses, the Canon 85mm f/1.2 L has an almost mythic reputation. It’s combination of superior optics, focal length and fast aperture make the lens perfect for portraits and low-light photography. Shooting with this lenses at f/1.2 turns distant backgrounds into buttery smooth colors with wonderful bokehs. Sigma takes on this legendary lens with its new Sigma 85mm f/1.4 EX DG HSM lens for $1000 less! Designed for both full frame and crop APS-C sensors. The Sigma 85mm produces beautiful bokehs just like the Canon 85mm L. Both lenses are sharp producing images with great color and details. Comparing the above images, it is really tough to tell which lens produced which image. 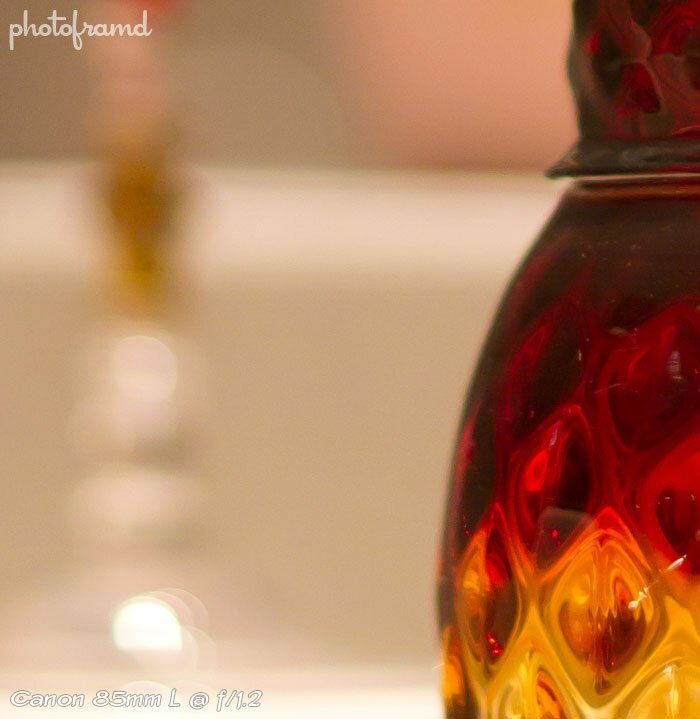 One thing you will notice is that the Sigma 85mm at f/1.4 produces a sharper edge than the Canon 85mm L at f/1.2. This is to be expected, but bares saying. The Sigma 85mm f/1.4 EX DG HSM is a wonderful lens and compares shoulder to shoulder with the Canon 85mm f/1.2 L. In fact, the biggest difference between these lenses is the price. The Sigma 85mm is over $1000 less than the Canon 85mm L. Sigma has another winner on its hands. The Sigma 85mm f/1.4 EX DG HSM is available in mounts for Canon, Nikon, Sigma, Sony/Minolta and Pentax for $899. The only issue I had with the Sigma was exposure in RAW. 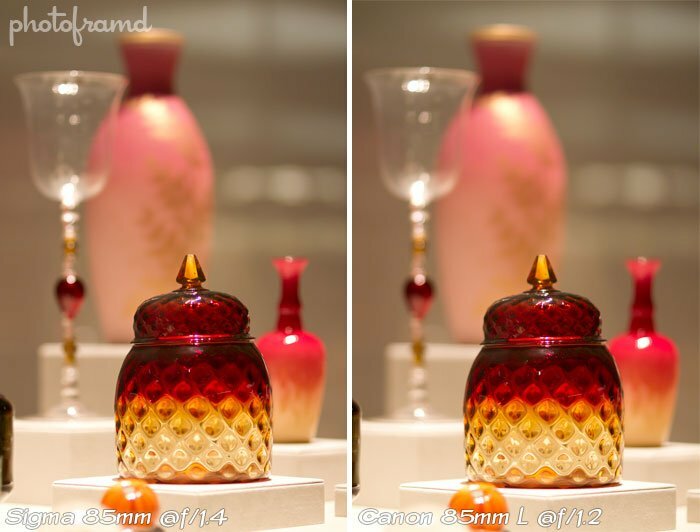 The images with the Sigma 85mm on the Canon 7D when shooting RAW were much darker than the Canon 85mm L in RAW. I had to adjust the Sigma photos about half a stop in CS5 to balance the exposure with the Canon images. The statute scene was also more saturated with the Sigma than the Canon. (This was not the case with the antique glass scene. It was nearly a perfect match in exposure and saturation.) Both of these issues could be a problem with CS5 and Camera Raw 6.1 reading the file. I did enable Abobe’s Lens Profile in ACR for all of the test images. The preview images on the 7D’s LCD looked like a perfect match. Optically, the Sigma is a great lens, directly on par with the Canon 85mm L.
I’d be VERY curious to see and AF comparison too! As far as speed of focusing? That’s very subjective. If the Canon 85mm L is completely out-of-focus or goes “hunting” for focus, it takes forever. I did not notice that with the Sigma. Or, let me say, it was not as annoying with the Sigma. 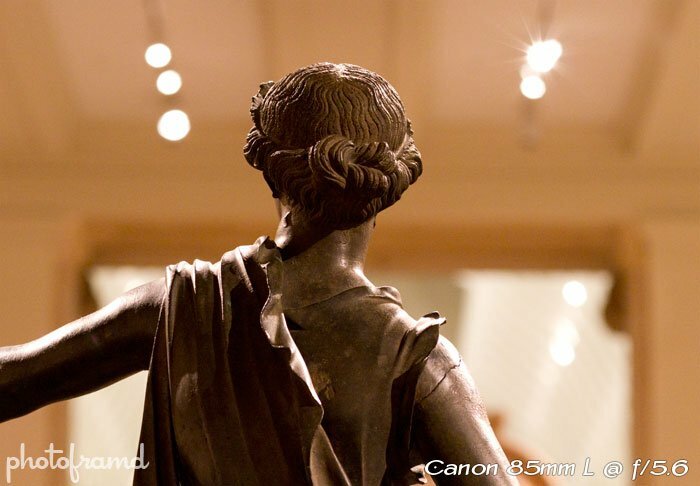 As far as AF accuracy, the Sigma was dead-on with the Canon 7D. But, I would expect that from this lens. 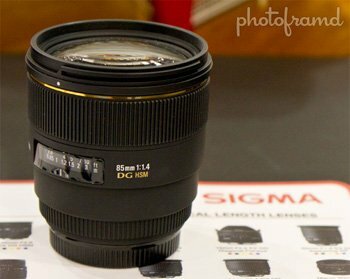 It is a high-profile lens for Sigma and is already being promoted in Ads. I think it is another winner just like the Sigma 50mm f/1.4. Great review! Thank you for posting this. Love the side by side photo comparison. I think the Sigma looks amazing! I am definitely saving up for this lens. It’s a fantastic lens! And, it’s $1000 less than the Canon L.
Great review. I was looking for a lens that is comparable to Canon 1.2 and is within my price range, and you help me find it. Thanks. It’s a fantastic lens … and it’s a bargain too! 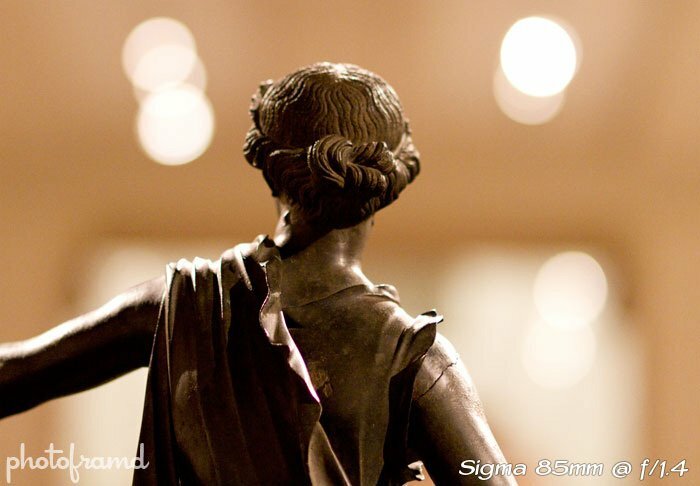 It wasn’t clear to me whether the statue was a crop or a full photograph, but the Sigma does appear softer to me wide open–notice the statue’s hair. I don’t know whether the focus plane is different between the two shots or whether it’s a lens sharpness issue. Other than that it appears to be a winner! The statute photos are uncropped. The Sigma set was adjusted (as I stated in a previous comment) to match the exposure and saturation of the Canon set. That could explain what you are referring to. 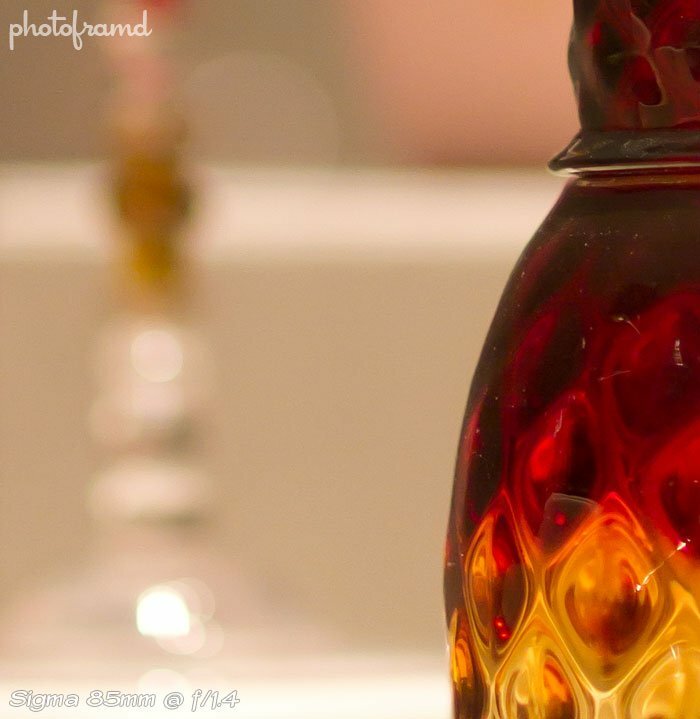 As for sharpness and detail, look at the other set of photos for the antique glass. The Sigma and Canon were almost an exact match. Pretty impressive considering the price of the Sigma lens. Curious as to the exposure on the statue. Were they taken with identical manual settings, or was it on aperture-priority? All photos were taken on aperture-priority. But, ISO was locked at 200 and the shutter speed did not vary much. Hi, i know its been a year since this thread started, but just wanna know if the inaccurate focusing of this 85mm lens can be fixed on the lens calibration? because i hear’ed that the lens is inaccurate focus some times.. I have not had a problem focusing with this lens. Also, have not heard others complaining about it. It’s a great lens and a bargain compared to the Canon L As for micro-adjustments, the 7D can keep track of 20 lenses by serial number regardless of make. The option is located in C.Fn III -5 – Drive AF Microadjustment. alright, will buy one =) will try the do it all lens hehe! thanks!